David came to be our Team Rector in October 2016. He moved here with his wife from Bermondsey in London where they had lived for 27 years. They have 3 grown up children. Whilst living in Bermondsey he worked as a church leader in Tower Bridge Road before Bermondsey is the trendy place it is today! David started out in his career as a research scientist working in science on vaccine development, and also on HIV AIDS. He left science to work in overseas development for 20 years, working for a variety of organisations including Tearfund and USPG. David was ordained in 2013 at Southwark Cathedral. "I am excited to be part of this great Team. Rugeley is a great place, the people are really friendly. The churches of the Team Ministry are communities of hope, places where anyone can find a welcome, a place of refuge, calm and prayer. We try hard to reflect the big, inviting and generous love of God"
Interests are: Riding his motorbike, gardening, walking, reading and going to the gym, and hanging out in Costa Coffee. Craziest thing to ever happen to him: Having his car nicked by two members of the congregation (in London), while preaching a sermon! Nice feedback! The good thing was that the Met police recovered the car within the hour: A miracle! George has been Team Vicar since May 2014 (though did take 12 months leave to have a baby!). George moved here from Grimsby, though has lived in various places including south Lincolnshire, Oxfordshire, St. Albans, Nottingham, and even spent 4 months in South Africa. She lives with her husband, their daughter, and their cat! Since University days, George has worked in the Church. George is passionate about the Church reaching out to all, engaging with the local community and sharing the love and support of God. Interests:Spending time with family, rock music, holidays, and days out to local festivals, especially if they involve music or food! She also loves a cup of tea and watching Coronation Street! Craziest thing: Probably planning a fire-breathing, festival themed wedding in just 3 and a half months! The Benefice of Brereton, Rugeley and Armitage has always been part of Brian’s life. He was born in Handsacre, where he lived for 6 months before the family moved to Rugeley and onto Colwich when he was 7. Brian completed an Electrical Apprenticeship at GEC Measurements, Stafford (Now GE Grid Solutions) where he works as a Mechanical Design Engineer. He lives in Brereton with his wife Alison (Church warden and Verger at St Michael’s Church) and two sons James and Alan. 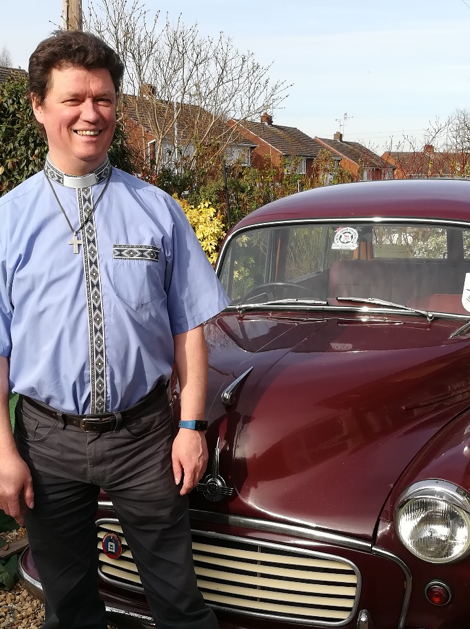 It was his wife and her family that brought Brian to the Church and led to his training as an Ordained Local Minister through the local training scheme of Lichfield Diocese and Brian was Ordained Priest at St Augustine’s Church. Brian is passionate about the need for the Church to engage in ministering to everyone in need in God’s Kingdom and has led several visits to Hands at Work in South Africa with a local charity “The Link for Life Project”. Interestsalso include Classic car restoration, caravanning, photography and walking with the family and their two border collies. Craziest thing:Jumping out of a perfectly good aircraft…. with a parachute obviously. After 14 years in Cannock, Peter moved across the Chase to become Vicar of St John the Baptist Church in the Parish of Armitage with Handsacre in November 2017. He is married to Liz and they have two daughters and four Grandchildren. Before becoming a Vicar, Peter spent 18 years as a Professional Footballer playing for Huddersfield Town and Walsall. It was particularly satisfying therefore when Peter was asked to become Club Chaplain at Walsall, a role that he has occupied for the last 5 years. Added to his role as Chaplain, Peter was pleased, in March 2018, to become lifelong ambassador to the W.F.C. Disabled Supporters Association. Though Peter has spent more time living in the Midlands than in his native Yorkshire, he is still a proud Yorkshireman; though he hasn’t owned a flat cap and ferret for quite some time. Apart from sport, more watching than playing these days, Peter enjoys reading, walking and Belgium beer. Particularly when sampled in Brugge, one of his favourite places to visit. Originally from the North East she moved to the Midlands in the 1970s and came to Slitting Mill in 1997. She started work for Barclays Bank, then moved into computer consultancy a few years later, working in Scotland and Northern Ireland for plane, ship and oil rig builders. She worked in an office in Belfast which was the site of the original slipway of the Titanic. She has a grown up son living not far away in Stoke. Jane joined us in June 2005, with a wish to swap the long hours of freelance computing for a ‘cushy’ job locally. Interests are: Computers (yes, still), reading, music (all genres), being taught world politics by her son, and working through her bucket list. Craziest thing to ever happen to her: Being asked to herd a gaggle of geese into a pen with a sheepdog. Job done. As a child Colin discovered that the two passions in his life were music and photography and he dreamt of life as a global rock star. Unfortunately his lack of any discernible talent and ability led him naturally to a career in local government where his obvious shortcomings proved not to be a drawback. Such was his affinity with public services he rose to become a Senior Government Advisor, working in Whitehall and dealing with councils in the West and East Midlands. He eventually decided to leave behind the bright lights of London and set his sights closer to home. Seeking even greater levels of excitement and challenge he accepted the role of Parish Treasurer in 2017. Fellow PCC members have quickly learned to appreciate Colin's encouragement and support. Colin is married to Sue; they have two spaniels, Ruby and Molly, who ensure Colin gets regular exercise. He still often wonders if the world is ready for yet another ageing rock star. Born and raised locally she has always taken an interest in past, present, and future developments in the local area. Roz enjoys taking part in a variety of activities related to the Church, and is very much looking forward to her new post as Parish Secretary. She is committed to assisting the dedicated and forward-looking Ministry Team of The United Benefice of Armitage, Brereton and Rugeley; in developing the role of the Church within the Local community. A website for the benefice of Brereton, Rugeley and Armitage.